The Popovici name is associated with legal service in Romania since the beginning of the last century. Our Senior Partner holds the unique background of having consistently practiced in leading international law firms located in Paris and London combined with a double legal education. 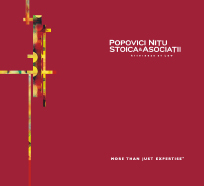 More than half of the Popovici Nițu Stoica & Asociații team members have specialized in a wide range of practice areas in numerous jurisdictions, with prestigious universities from Paris to Washington, from Rome to The Hague. The Firm has linked its name with the creation of the essential Romanian market economy institutions after 1990 having advised for: the first privatisation legal framework, the creation of the first stock exchanges, the first major real estate project, just to quote few of our achievements. Over the years, the core team has remained unchanged.